Thanks to the Belgian customs (never thought I would have to say this) we know this blended whisky was bottled on 20/1/1964 by Macdonald&Muir Ltd., Leith, Scotland. What the label says: "the basis of this whisky is the matured product of two of the finest malt distilleries in the Scottish Highlands, Glen Moray-Glenlivet and Glenmorangie of which we are the proprietors." This sounded like a potentially worthy specimen which might display some of the complexity that old whiskies made with in pre-automation days are supposed to display. Old fashioned "Golden Promise" barley would have been used instead of modern varieties. Wooden washbacks, floor maltings, oven kilns rather than drum, direct fired stills - all those sources of micro variations within a batch that may have resulted in more complex flavors. A fly in the ointment is that Highland Queen seems limited to this single issue. (There are plenty of references on the web to this issue - and none to any other). Why? Was it a dog product that just didn't taste good, so no further batches were produced? Update: I'm wrong. Highland Queen is an old traditional blended Scotch that is still produced. "First produced by Roderick MacDonald around 1893 while with Alexander Muir of Lieth. 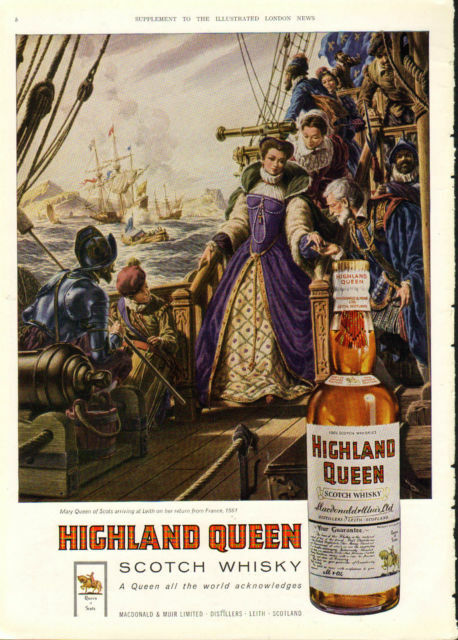 / Highland Queen Blended Scotch Whisky was named in honor of Lieth's connection with Mary Queen of Scots. 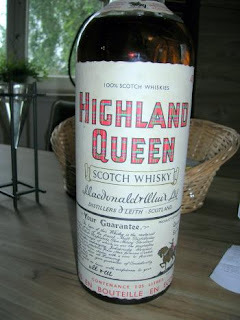 Highland Queen consists of 30 - 35 percent malt prodominantly Glen Moray." I see a NAS 40% abv. version of Highland Queen available for sale in Australia ($35) right now. 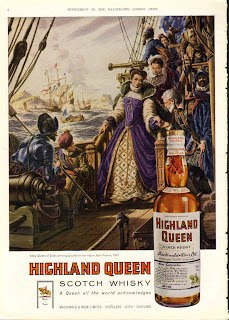 I also see some 1930s Highland Queen ads on Ebay. Nose: Honey, hay, distant sherry with citrus apricot jam and musk noted, talcum dust and a slight musty mineral note that I'm coming to associate with old whiskies - perhaps a flavor signature of bottle maturation. Initially sweet with malt and grain sugars, the entry and expansion are disappointingly thin after the nice nose. You can taste some young grain whisky burn. 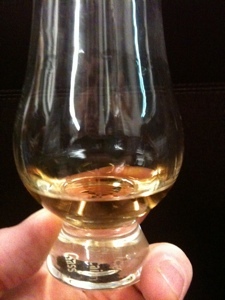 However, tasting beyond the young grain there are some august notes of old style sherried malts with a bit of peat. The finish is medium short with little tannin but some wisps of oak, smoke, and malt. There is some excellent malt here, but buried beneath a young and undistinguished grain whisky. A few drops of water adds a faint floral note and a bit more apricot on the nose. However it does more on the palate, raising some sweetness and fruity notes that fill in the flat flavor profile. It's no world beater - but the flavors that are present are interesting as old Spey malt flavors - but in diluted form. That degree of flavor dilution may be why this brand only lasted a year. (Or, as it actually turns out - lasted over a century and still going - as is the actual case). I can recommend this for a person who wants a whiff of the antique flavor profile - but only in that context. The old-established blended Scotch whisky of Highland Queen, once a staple of the Glenmorangie business, is now part of the Bordeaux-based concern of Picard family (Terroir Distillers), which also owns Tullibardine distillery. A 12-year-old variant of the blend has recently been released to augment the ‘standard’ expression with no age statement. The nose is full and rich, with icing sugar sprinkled on pineapple, spice and black pepper. Relatively full-bodied, with spice, malt and hazelnuts on the palate. The medium-length finish features ginger and fruit and nut milk chocolate. Tullibardine Distillery Visitor Centre, Pharlanne Delicatessen, 13 Bridge Street, Kelso TD5 7HT and at www.pharlanne.co.uk 40.0% ABV, 70cl, £25.00, Pharlanne, distillery website.